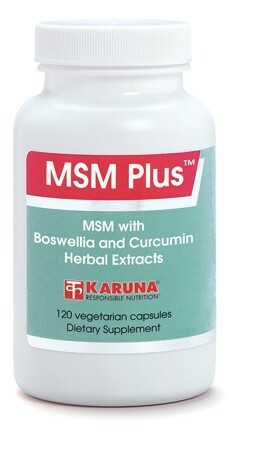 MSM Plus supports cartilage health with Methylsulfonylmethane (MSM) along with botanicals from the Ayurvedic medical tradition that possess immune activity-balancing properties. Boswellia serrata (Indian Frankincense), a source of boswellic acids, has traditionally been used to enhance the health of joints. Curcumin is a highly purified extract of Turmeric (Curcuma longa), used similarly in Central and East Asia. Both curcumin and boswellic acids support normal regulation of immune system activity by helping to balance the production of prostaglandins and leukotrienes. MSM Plus contains daily dosages of all ingredients in the amounts supported by clinical trials. Boswellia serrata, a source of boswellic acids, has traditionally been used to enhance the health of joints, and to help resist undesirable age-related changes in the joints (Altern Med Rev 1998 Aug;3(4):306-7). Both curcumin and boswellic acids support normal regulation of immune system activity by helping to balance the production of prostaglandins and leukotrienes (J Ethnopharmacol 1993;38:113-9). Both Boswellia extracts, standardized for boswellic acids, and curcumin have been effective either alone or in combination formulas for supporting long-term, comfortable function of joint structures in controlled human trials (Phytomedicine 2003;10:3-7; J Ethnopharm 1991; 33:91-5; Ind J Med Res 1980;71:632-34). Suggested use for adults: Two capsules, two times daily with meals, or as directed.